Only the local media covered it. The city is giving her a medal next week. Just thought you’d like to know. 7 Day Blast Belly Fat Diet! Have no Fear, it's just a ride. The 5,125-yearlong Mayan calendar ends on December 21, 2012, which many claim portends a massive global transformation. Some dread its arrival, believing it will be the beginning of the end. Others await it with delicious anticipation, expecting it to be the catalyst for a quantum leap of consciousness, the dawning of a true New Age. Others wonder if anything at all will occur--remember Y2K? 2013: The End of Days or a New Beginning? examines all of the popular myths, prophecies, and predictions circulating about 2012, including the Mayan teachings of time acceleration and global awakening on a consciousness level. Furthermore it takes an in-depth look at lesser-known predictions and prophecies, and at the more scientific and reality-based challenges we will face. * Will cosmic and earthly chaos disrupt our lives with destructive sunspot cycles, volcanic super-eruptions, monster storms, mass extinctions, and asteroid threats? * Will huge leaps in technology create bionic humans, computers that think, and an end to all disease--possibly even death itself? * Will economic and geopolitical powers shift out of the West and into the "the New Eurasia," with new wars being fought over dwindling resources as global warming takes its toll? * Will this be the evolution revolution of human consciousness--or the final countdown that leads to Armageddon itself? * Will it be the apocalypse so many have feared--or the rebirth of the world and the transformation of humanity? There is much, much more to the 2012 enigma than just an ancient calendar, and 2013: The End of Days or a New Beginning? will prove it. "Bûche de Noël is the French name for a Christmas cake shaped like a log. This one is a heavenly flourless chocolate cake rolled with chocolate whipped cream. Traditionally, Buche de Noel is decorated with confectioners' sugar to resemble snow on a Yule log." 1.Preheat oven to 375 degrees F (190 degrees C). Line a 10x15 inch jellyroll pan with parchment paper. In a large bowl, whip cream, 1/2 cup confectioners' sugar, 1/2 cup cocoa, and 1 teaspoon vanilla until thick and stiff. Refrigerate. Then please ship one to me, because under no circumstances would I ever be coordinated enough to make this. I could however enjoy eating a slice or two. Huge Cube Photographed Near the Sun! 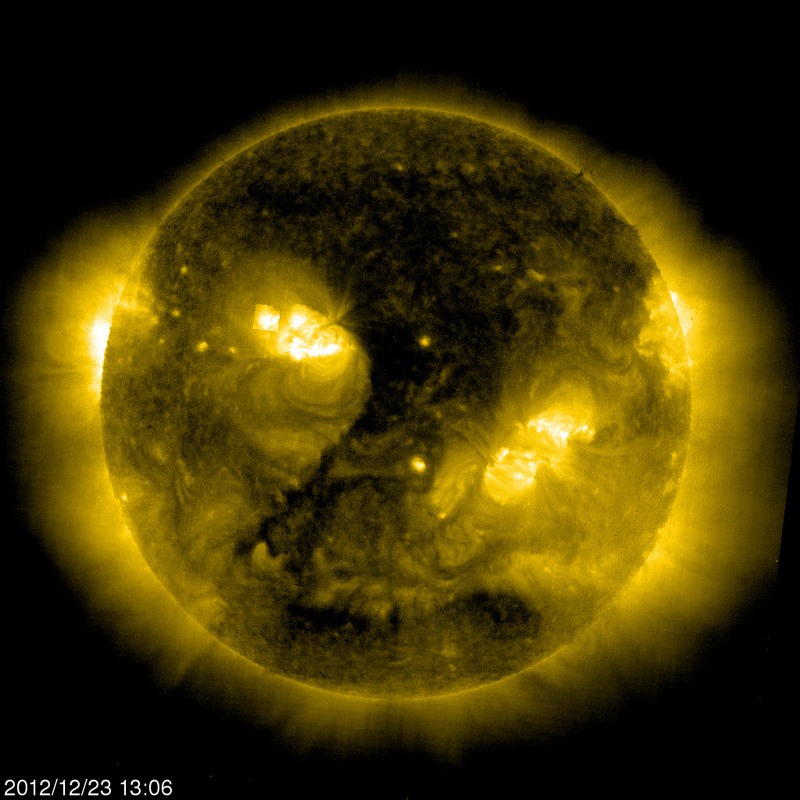 Here is a massive cube photographed near the sun. This cube has been spotted in a few different NASA Soho photos but this is the best one yet as it shows gas's in front of the cube and is much more defined. You can find the image herehttp://sohowww.nascom.nasa.gov//data/REPROCESSING/Completed/2012/eit284/20121.... This Unidentified object appears to be floating around the sun. Always Look Up UFO's Could be flying above you! Man! NASA is burying themselves so deep in lies, I can't see how the heck they will ever dig themselves out of﻿ it. Very cool, thanks﻿ for sharing. Looks like a giant UFO harvesting something...that is why its square in shape...to carry more. Ready to Fall off the Wall Street Cliff? End of the World as We Know it? Now What? 12/21/12-What Have we Learned? What DID we Know? Dec. 21, 2012 Just Another Day?